LAUGHED AND had fun over a movie which made mockery of my fraternity. For a change I did not mind. PEEPLI LIVE's visuals were afresh in my mind when one of my news coordinators called up last night to tell me that a woman had a dream that she would be dying at midnight. I thought wow a TRP story! Lot of things were wrestling in my mind. Should we send an OB van to monitor her movements live till she kicks her bucket. And run a scroll saying few more hours before this lady bid adieu to life. Will she die or not! Why she had this dream! Then good senses prevailed – we didn't give it a damn attention and as expected it turned out to be a bluff. For people who watched Peeli Live and had riots of laughter over the manner media functioned. Let me tell them it is based on a true story which was reported in October, 2005 in a village in Madhya Pradesh. The only difference is in the real story it was not a farmer but an astrologer. Indian Express carried an interesting story about the entire episode. I still remember it. Let me tell you guys what happened on October 20, 2005. 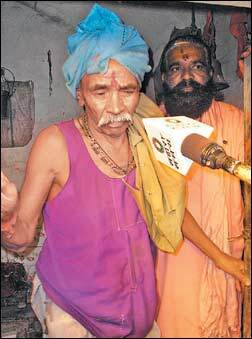 Let's begin at the very end: Pandit Kunjilal, self-styled astrologer, is alive and well and living in Betul, Madhya Pradesh. At precisely 4 pm, Kunjilal (according to Star News’ correspondent) coughed. He drank some water and as Sahara’s correspondent reported in offended tones, ‘‘suddenly rose one hour early’’ from his certain death. Asked to explain the postponement of his date with darkness, the smiling media star of the day replied that it was all due to good wishes, prayers. ‘‘And how long do you propose to live, now?’’ demanded a disappointed TV journalist. Kunjilal grinned broadly: ‘‘God knows how long I will live.’’ Coming from a man who had predicted that he would die today between 3pm and 5pm that’s really funny. 3 pm onward: TV news channels Star News, Aaj Tak and Sahara who took Kunjilal at his word and devoted hours of live transmission time to his close encounter with death, were, like Queen Elizabeth II, not amused. He had spoilt their headlines. ‘‘Aaj Meri Mauth Hai (Star News), ‘‘Aaj Maroonga’’ (Aaj Tak), sound infinitely more filmi than ‘‘Mauth ka drama khatam’’ (Star) or Aaj Tak’s tame, ‘‘Mauth Talli ’’ (death postponed). Meanwhile, where was poor Kunjilal? Left to die in Betul while they slugged it out in the studio. Star News and Sahara also staged it like a WWF wrestling bout between The Rationalist and The Astrologer. However, Star’s sympathies lay with the latter and, in particular, Prem Kumar Sharma from Chandigarh. As 4 pm neared and Kunjilal was obstinately still breathing, the anchor quizzed Sharma:‘‘But what if the time (of birth?) was 8? Or 8.30? Or 9?—is death a possibility then?’’ insisted the earnest anchor knowing this was a matter of life and death. Sharmaji was most unhelpful: No, 8 is not possible, 8.30 is not possible and nor is 9. 3.58: Just before the appointed hour, Aaj Tak and Star News went for a commercial break, no doubt unable to bear the tension. When they returned, it was to announce Kunjilal calling off his death vigil because the worst (time) was over. But the channels were not giving up so easily. 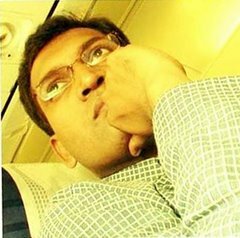 Feeling almost cheated by his living, they flogged the story to death. On Aaj Tak, it was a triumphant smiling rationalist Ghosh versus Rao until a weary Rao could be heard asking ‘‘How long will this go on?’’, while on Star News, astrologer Sharma felt that Kunjilal probably staged the entire drama for media attention. 4.20: In the absence of Kunjilal, his son and daughter took over on Aaj Tak to say how happy they were daddy was alive and how poor mummy-ji had fallen asleep. The channels were getting very tetchy now—having exploited and been exploited by Kunjilal, the channels now turned on him: Sahara Breaking News: ‘‘Khatam hua natak’’, Astrologer Rao on Aaj Tak: It’s not right for an astrologer to predict such a thing. And finally, Star News offered this by way of explanation for its behaviour: ‘‘It is always our aim to bring you the truth, so we stayed with the story. This was a drama, nothing more.’’ Never had a truer word been spoken. 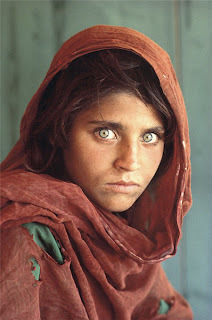 Till date the famous Steve McCurry photograph of a young Afghan girl that adorned the cover of National Geographic magazine was the most memorable photo of green-eyed Afghan Girl which he clicked at some refugee camp in Pakistan. But now there is another Afghan Girl photograph which has not only set to become memorable from my point of view but also raise questions on the fate of women in the war torn country. The two photographs taken by different individuals make your cerebrum work hard to look into the pain the individuals gone through in their own respective lives. It is not a mere photo to appreciate but life story to feel. The face on the cover of Time magazine is graceful, composed and unthinkably maimed. The heart-shaped hole where 18-year-old Aisha's nose should be is a mark of Taliban justice _ a visceral illustration, the headline suggests, of "what happens if we leave Afghanistan." The portrait has quickly becoming a symbol of the stakes of a nearly decade-old war. For me the photo is disturbing on so many levels but I think that it was completely necesaary, unfortunately. Interestingly, while I was reading comments on websites about the photo I found many people terming the cover page as avoidable and out-cried that the photo might affect children. If the response proves it's still possible for pictures to provoke a visually saturated culture, it also shows how much viewers have come to accept graphic images. Under orders from a Taliban commander acting as a judge, Aisha's nose and ears were sliced off last year as punishment for fleeing her husband's home, according to Time's story and other accounts. She said she fled to escape her in-laws' beatings and abuse. Now in a women's shelter, she is set to get reconstructive surgery in the U.S., with the help of Time, humanitarian organizations and others. Aisha posed for the Time cover photo because she wanted readers to see the potential consequences of a Taliban resurgence, the magazine said. Prominent Afghan women have expressed concerns that a potential government reconciliation with the insurgents could cost them freedoms they have gained since the 2001 U.S.-led invasion toppled the former Taliban regime.